BUKAVU, Congo (CNS) — Bishops from eastern Congo criticized the failure of their government and the United Nations to act against “genocide, jihadist fundamentalism and Balkanization” in the country, which is widely considered Africa’s most Catholic. 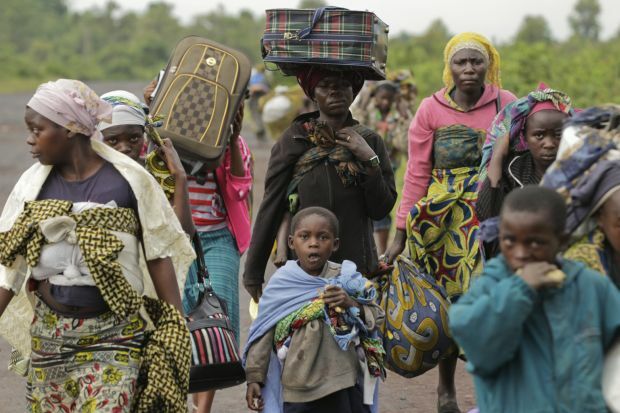 “For more than 20 years, the eastern populations have fallen victim to war and insecurity — in 2010, the victims numbered 6 million dead, and the toll continues,” said the bishops from eastern South Kivu province. In a pastoral message dated May 25, the bishops said they had been moved by the “profound distress” of “populations bruised by raging violence.” They said villages had been burned with impunity by armed gangs, leaving local populations facing “famine and misery,” while criminals wielding “machetes, knives and axes” had cut throats, mutilated children and disemboweled pregnant women. “We pay homage to Congolese officers and soldiers who have shown devotion and shed their blood in this cause. But security, peace and territorial integrity do not, curiously, seem to have been priorities for our public authorities,” said the message, signed by Archbishop Francois Maroy Rusengo of Bukavu and bishops from Goma, Butembo-Beni, Kindu, Uvira and Kasongo. Up to 5.4 million people were killed in Congo in a series of 1995-2003 wars involving eight countries and two dozen armed groups, while militia violence has since continued in many parts of the mineral-rich country. In 2013, U.N. forces helped government troops defeat Tutsi rebels, allegedly backed by neighboring Rwanda. In February, the Congolese army launched an offensive against Hutu insurgents in advance of October elections, which opposition politicians have accused President Joseph Kabila of seeking to delay. The bishops said they recognized that the United Nations had backed initiatives to secure peace, but added they did not understand why no action had been taken to prevent a series of massacres since late 2014, including the killing of 419 people at Beni. “The state is allowing the situation in the east to decay — we find it difficult to understand our government’s ambiguities, conflicting statements and paradoxes,” said the bishops. About half of Congo’s 70 million inhabitants are Catholic. The church runs 60 percent of primary and 40 percent of secondary schools, as well as an extensive network of hospitals, clinics, shops and farms. In February, Father Jean-Paul Kakule was shot dead by assailants at his church in northeastern Congo, while on May 12 Bishop Placide Lubamba Ndjibu of Kasongo survived an abduction attempt. In their message, the bishops said they were perturbed at the official silence surrounding the October 2012 abduction of three Assumptionist priests, whose fates remain unknown, and feared young recruits were being “trained for international terrorism” by jihadists of various nationalities. “All of this is taking place in the context of an economic mafia and political-military corruption, supported by pillaging on a grand scale of our abundant natural resources in minerals, forestry, wildlife and petroleum. … The population of the East has the net impression it is unprotected by its own state and abandoned by the international community,” the bishops said.